Well Met my knightly companion! I thought about adding Conclave Tribunal to make use of your defenders by convoking them while defending and waiting for your Arcades, the Strategist, just a suggestion. Venerated Loxodon is very good here too to make your defenders bigger. You may discard Tetsuko Umezawa, Fugitive though if you do that. Dream Eater - bounce stuff and alternate wincon if in case you didnt draw arcades. 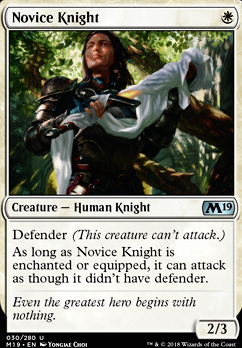 Novice Knight is very good here too for it serves as a blocker early game and if you put more +1/+1 counter on him plus arcades, it becomes a bigger threat. I hope it will help you improve your deck and +1 from me who supports rogue deckbuilding. Here is your decklist. Feel free to tune the manabase and/or change the deck to fit your playstyle. The immediate problem I see is that you're running far too many lands. Normally a deck like this with such low card costs would be running about 22 lands, give or take. 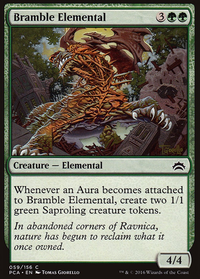 Auras in general are pretty bad in Magic since you're setting yourself up to get 2-for-1'd by removal, and since all of your creatures also work by being equipped, I would slant more the equipment route since at least they're reusable after your creature gets killed. This creates another problem though - there's not many good equipment cards in standard currently. To remain within your low mana curve a couple you could try are Short Sword or Cobbled Wings. Marauder's Axe and Shield of the Realm are also probably usable. I still wouldn't run too many equipment, no more than maybe 4 or 5. In my own quest to make auras work in standard, I found that On Serra's Wings was always the aura I wanted showing up. You could try a couple of those. Novice Knight is hit or miss. I found it to be pretty good vs aggro decks but too often it was sitting there doing nothing because I'd either have no auras for it to attack with, or have better creatures to put my auras on. 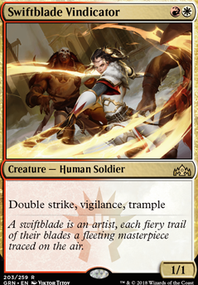 Dauntless Bodyguard is a pretty good replacement for it since it can attack early without an aura and if it's drawn later on it can instead be a shield for one of your other creatures. DangoDaikazoku Hey man, thanks for your comment! First of all, love the name! Immediately made me sing the song in my head haha. I appreciate your input on my deck, so let me just explain why I picked some things. I put in Pillar of Origins for two reasons. 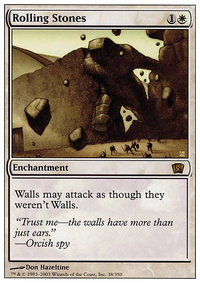 One, I could declare either Wall or Dragon, allowing me to get a free mana with either, also freeing up mana on my board for potential combos, extra creatures, etc. I also picked it because it's an artifact, and would go well with Tezzeret, Artifice Master Zero ability, allowing me to draw two cards, if I have three or more artifacts on the field. I have Tezzeret's Gatebreaker in for three reasons, one is that it allows me to basically scry 5 cards, and seeing as how most of the deck is Blue or Artifacts, I'm almost guaranteed to find something I could use from it. Reason two being it's another artifact for Tezzeret's draw ability, and reason three, I could always use it as a backup in case both of my Tetsuko Umezawa, Fugitive or Suspicious Bookcase's are in the graveyard, exiled, bottom of my deck, etc. I only kept Novice Knight in there for a decent one drop creature, so I could totally substitute in two more Wall of Vines instead. Putting in some three drops is probably a good idea as well, do you have any recommendations? I'm looking on gatherer now, but any advice would be appreciated. I'll also totally add some counter spells to my sideboard. Thanks again for your comment!